A British tourist Layla Khan issued a warning to holidaymakers and foreign tourists after she spotted a street trader spray painting white grapes red. Layla Khan, 23, and her cousin investigated food they had bought the previous day from the local street market. They suspected that the fresh vegetables and fruits they bought at the local street market because her aunty suffered sickness and diarrhea after eating the grapes. 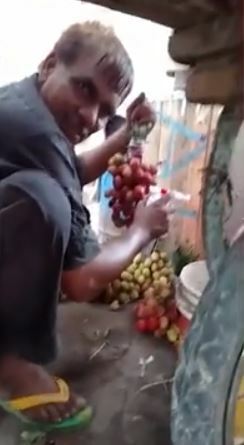 She was shocked to see a vendor who sold them grapes to have crouched behind a stall using a can of Win spray paint to dye the fruit – and they began secretly filming him. The middle-aged man spins his head around, notices the camera and smirked – before placing the grapes on the ground in a pile of other painted fruit. The man, who also had red paint on his hands, did not even react when questioned in the video. Layla, a carer from Birmingham, was visiting family in Afzalpur, a village in Mirpur, Pakistan in August. She said: ‘Tourists need to keep their eyes open and be very careful in street markets like this. ‘You can easily be exploited and it is very dangerous for your health. The man does not care that he is feeding people poison and it left my aunty very ill. When we confronted him he proudly admits, that, ‘Everyone is doing it’ – and smirked. I saw many British people walking around – it’s a spot that is popular with tourists and a busy area. My aunty had fallen ill for two days with diarrhea and sickness but had only eaten grapes from a man on the street. Layla said she reported the incident to the local police force who have been approached for comment. KASHMIR’S SILK INDUSTRY POISED FOR REVIVAL?